I am not a member of the Tea Party Express. They deserve much credit for getting the nation to address our debt problem and how our government operates. Per their website they profess that "Tea Party Express is considered the largest and most successful political action committee within the Tea Party movement." Below is their mission statement. After the mission statement are my comments regarding their objectives. I don't believe we are far apart except I support Obama. "We are committed to identifying and supporting conservative candidates and causes that will champion tea party values and return our country to the Constitutional principles that have made America the “shining city on a hill". Tea Party Express is proud to stand for six simple principles: 1. No more bailouts, 2. Reduce the size and intrusiveness of government, 3. Stop raising our taxes, 4. Repeal Obamacare, 5. Cease out-of-control spending, 6. Bring back American prosperity." 1. No More Bailouts: This is a worthy objective; however, many of our businesses are so big that they would have driven the economy into a depression if they were allowed to fail. An example is the banking industry. Many banks are too big to fail and they should be broken up. The five largest banks in the country control deposits in excess of the GDP of the United States. If these banks failed the depression of the 1930's would be the second worse depression behind what would have been "The Really Great Depression of 2008". After they are broken up, let them fail! Bailing out AIG was deemed necessary because its destruction would have resulted in massive bank failures. The saving of the auto industry is less conclusive. Many believe that the bankruptcy courts should have been left to handle it. This cannot be proved one way or the other. At the time, I felt that the government should error on the side of over reacting versus under reacting. Without government assistance, the bankruptcy process would have taken too long and the supply chain to the industry would have been destroyed. If the auto industry was the only problem at the time, I would have let them fail. "But we cannot rely on custom or conscious alone to interpret and enforce the rules; we need an umpire. These then are the basic roles of government in a free society; to provide a means where we can modify rules, to mediate differences among us on the meaning of rules, and to enforce compliance with the rules on the part of those few who otherwise would not play the game." There are areas where government sticks its nose where it does not belong. Fighting crony capitalism by breaking up oligopolies is one area where government has failed by doing nothing. Early settlers were less concerned about government over-regulating markets then about devious competitors trying to control markets. Today when a conservative complains about the destruction of free markets he is condemning the government saying it is over-regulating the markets and not allowing them to operate effectively. The damage caused by over regulation pales compared to the damage caused by markets taken over by oligopolies and oligarchs. At the same time, I agree much of the regulations created by government cost more than they are worth and should be eliminated. 2. Reduce the size and intrusiveness of government: Indeed, government needs to get a grip and get organized. Historically, all elected officials considered was what to do and then implement programs without scrutinizing its cost or how to measure the programs effectiveness. There was no budgeting process. Our government must go through the same process you do on your kitchen table; first estimate the revenue you have coming in and then prioritize how you are going to spend it. Historically our federal government just thought about what it wanted with no consideration where the money was coming from. This must change. 3. Stop raising our taxes: I know of no one begging to have their taxes raised. To put things in perspective I extracted the chart to the right from the Tax Foundation. 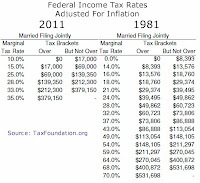 It shows from the period when Ronald Reagon was President until now our tax rates have actually decreased. If your taxable income, adjusted for inflation, was $75,000, your tax rate in 1981 and 2011 respectively was 37% and 25%. Your tax rate decreased. An individual having taxable income of $200,000, adjusted for inflation, had a rate of 54% and 28% respectively. His tax rate was almost cut in half. How low should we go? Further, I am not a tax expert; however, I suspect there are more tax loopholes today than 20 years ago. Tax loopholes are rarely repealed. 4. Repeal Obamacare: I do not agree with everything contained in the plan. However, having been raised in a family having strong Judeo/Christian beliefs, it is a given that this country needs a health system that is affordable to even the most poor and needy among us. Therefore, the plan needs to be amended rather than repealed. The plan, as written into law, does not take advantage of our free market system. There are areas in the country where one or two companies control 80% of the industry. Further, what the health industry charges for its services and how often the services are used are still in the hands of the providers, with the cost covered by the insurance companies. It is my hope, and belief, that Obama will amend the plan after he is reelected. 5. Cease out-of-control spending: One expenditure cannot be looked at in a vacuum. We need to look at total spending and prioritize expenditures. If we look at each line item separably we will never get our budget in balance. A good example is how we went to war in Iraq. When President Bush led us to war, there was no discussion as to how much it was going to cost and how we were going to pay for it. In fact, our President encouraged the nation not to change the way we were living, including our shopping habits. He made the case if Americans changed their live style as a result of 911 the enemy would have already won. He encouraged Middle America to continue buying ice cream from Cold Stone. The nation starts to spend before determining how it is going to pay for it. When a household reviews its budget it first identifies the amount of funds available. It then determines what it needs and wants to spend. It prioritizes the necessities; food, clothing and shelter. It then ascertains the revenue remaining and decides how the rest will be spent and saved. 6. Bring back American prosperity: If items one through five happen, item six is the result. Tea Party members need to think for themselves!